The call for presentations for the Project Management Africa Conference 2019 has now officially closed. Further communication will be sent out as per the timelines. The two and a half day Conference will be held at the Hyatt Regency hotel from the 8th to the 10th of September 2019. 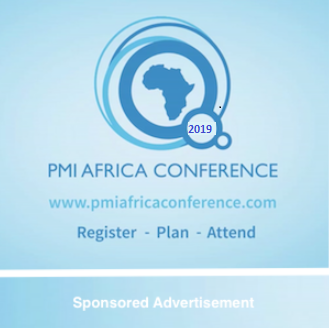 The PMI Africa Conference 2019 is the 4th conference in a series of conferences focusing on Project Management in Africa. The conference brings together leading researchers and practitioners operating at the nexus of project management and development in Africa. The conference is hosted by the PMI Tanzania Chapter in collaboration with PMI Chapters in Africa. Investment in Africa in varied sectors from infrastructure projects through to human resource development projects and humanity driven projects, has increased by billions of dollars compared to the previous decades. Africa has also been blessed with umpteen, though sometimes kept quiet, recitals of successes in projects. Amongst these successes, we are also very aware of the associated tales of doing business in Africa – stories wrought with corruption, deception, poor choice of partners, politics, the lack of understanding of the African market, the complexities of the terrain of Africa, language and cultural barriers – the list is endless. Is this sometimes distorted by organisations because of a pure lack of understanding or awareness of project management or its poor application, despite the vast number of varied project management offerings being provided throughout Africa? Does the fear of most eventually balances with the thought that delivering successful projects in Africa is a complex process that requires integrating several and complex variables. Africa, complex as she might be, may just need to be understood. Shouldn’t project management be at the foundation of Africa’s development and growth and be seen as the basic and fundamental set up, before anything else? Do project management professionals need to show, convince and demonstrate to All in Africa, especially decision makers that what organisations need to bring growth to Africa starts with Project Management. Have Africa change makers, decision makers and organisation been shown that what they do unconsciously today, to grow Africa is already part of project management? Can the application of Project Management to every aspect of delivery in Africa be attributed to the various successes and the eventual growth already seen in Africa? Do decision makers, change makers and organisation throughout Africa know that using project management purposely will positively enhance growth in Africa? Project Professionals may do and organisations may have also begun to, however the PMI Africa 2019 Conference wishes you to provide answers, demonstrate examples and explore this and how Africa’s Growth can, is and could be made possible through project management. Applications of the Code of Ethics and Professional conduct in delivering projects in Africa. Deadline for submissions of abstract is April 14, 2019 23:59hrs (GMT+2). Submissions can either be practice based or research based. The submissions must include a bio of no more than 150 words and high-resolution photo in jpeg format. Your submission maybe rejected if your Bio is more than 150 words or no photo is provided. The length of the abstract should be between 200 and 250 words. Your submission maybe rejected if your abstract is more than 250 words. Research based presentations will undergo a peer review process. NOTE: We reserve the right to reject or edit any proposal whose content is offensive or defamatory, explicitly unethical or if it contains content that is politically sensitive, supports racism, sexual or religious discrimination, illegal activities and terrorism. Deadline for submissions of full final presentations, proposals, papers: is July 29, 2019 23:59 hrs (GMT+2). Papers and presentations should focus on the subject of the title, and provide new contributions to the topic. Papers and presentations should be submitted in PowerPoint using the provided conference powerpoint template. Note that venue arrangement allows for classroom set up only (no tables). Deadline for submissions of abstract (Speaker Application Form): April 14, 2019 23:59hrs (GMT+2). Notifications on accepted abstracts: May 5, 2019 23:59hrs (GMT+2). Receipt of speaker agreement: May 12, 2019 23:59hrs (GMT+2). Submission of full final presentations, proposals, papers: July 29, 2019 23:59hrs (GMT+2).